We are accepting voluntary donations at the door of cold weather items for holiday gift bags for our senior clients! Please view our list of suggested items to donate on our FAQ page. We sincerely appreciate any support you can lend! Are you interested in vendor information for our 2019 show? If so, please click here to submit your contact information. Immediate-past year exhibitors have first right of refusal. Open registration will begin June 2019. Thank you for your interest. 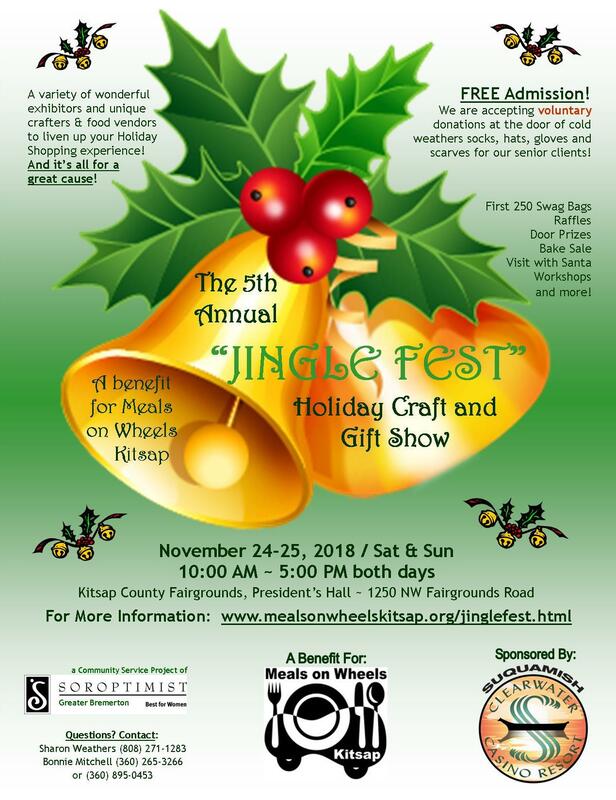 Jingle Fest’s goals are to provide a fun holiday shopping experience while raising funds and awareness for Meals on Wheels Kitsap. Meals on Wheels Kitsap has provided seniors in Kitsap County with nutritious, well-balanced meals served at one of eight community dining sites or delivered directly through our home delivered meals program for the medically-homebound since 1973. We aspire to produce a high quality event spotlighting some of the best artisan crafters and direct sales products available. Our show will be promoted extensively through traditional and social media venues to ensure the local community has been well informed of the event. Exhibitor Fee: $130 for two (2) days and includes a 10' x 10' space, piped & draped. Please see application for optional add-on's (tables, chairs, electrical) and related fees. Online registration is available. A paypal service fee of 3% will be added to the total amount due when registering and paying electronically and online. Please see *Regarding Online Registrations* below. Thank you! If using our online registration option, you will receive a PayPal invoice from us within 24 hours of your registration submission. The invoice is due on receipt. Your application will not be considered valid until full payment is received. All of our online applications are date & time stamped. If we receive more than one electronic application for the same direct sales company/product, we will process them on a first come basis. We will confirm receipt of your application by email. Thank you so much for your interest in Jingle Fest. As a community service project, Soroptimist International of Greater Bremerton Area will collect baked goods and coordinate and staff our bake sale on the day of the event.